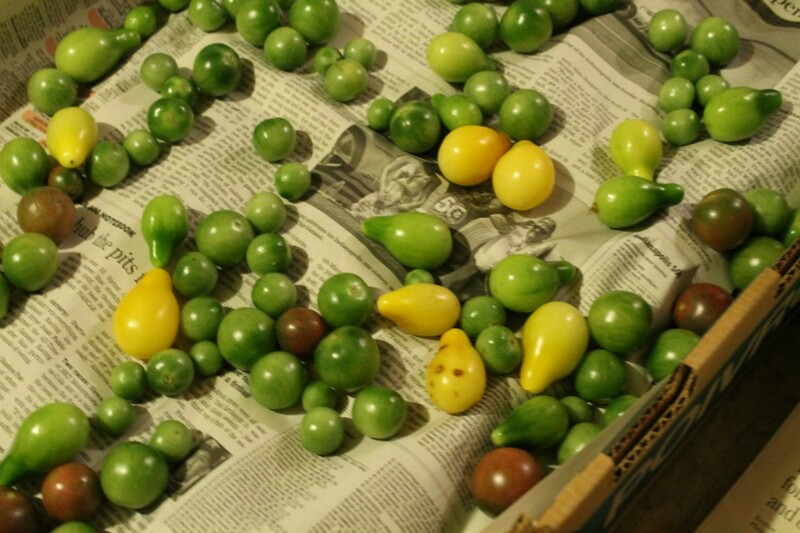 Well, I wasn’t expecting to be able to write a follow-up on the great green tomato experiment already. But in my most recent spot-check of the progress, I realized it was not going as expected. As stupid as it sounds, I think I was envisioning an orderly process where the green tomatoes slowly ripened one by one and I had a daily tomato out of it all the way through March. Yeah, I have no idea why I thought it would go that way, when gardens and plants never seem to follow rule books. But here’s the first thing I found when I opened one of the containers. Here we have perfectly green tomatoes next to some half-ripe and some fully ripe tomatoes. Okay, this is along the lines of what I expected. So I grabbed the fully ripe ones and set them aside. But then we get to the next “layer” and I find this. Hmmm. Rotting. That’s not good. And it’s green. Weird. And just below that one, we have this. 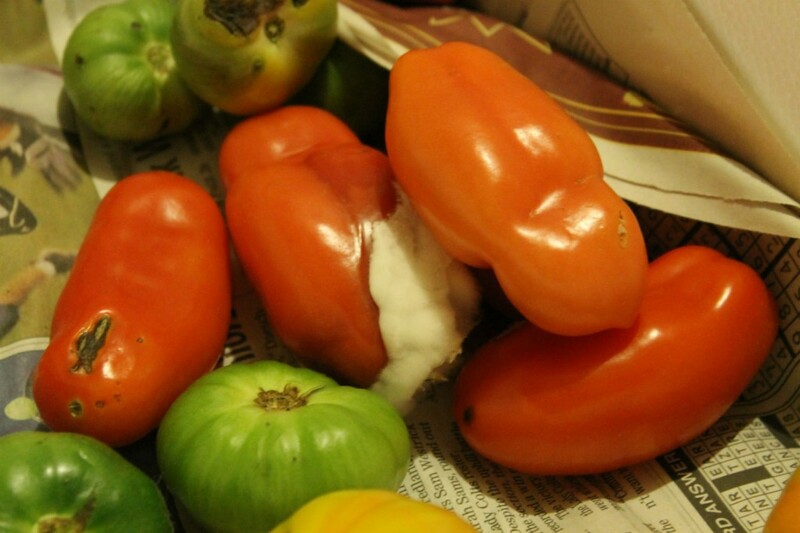 It looks like a sick penicillin experiment, right next to a totally green tomato! And this was one of the mild looking layers. I had perfectly good layers with some great ripe tomatoes, and some that were mold city and caused me to have to chuck the whole layer. I spared you from the grossest specimens. So it turns out that it does matter what stage your tomatoes are in when you do this. 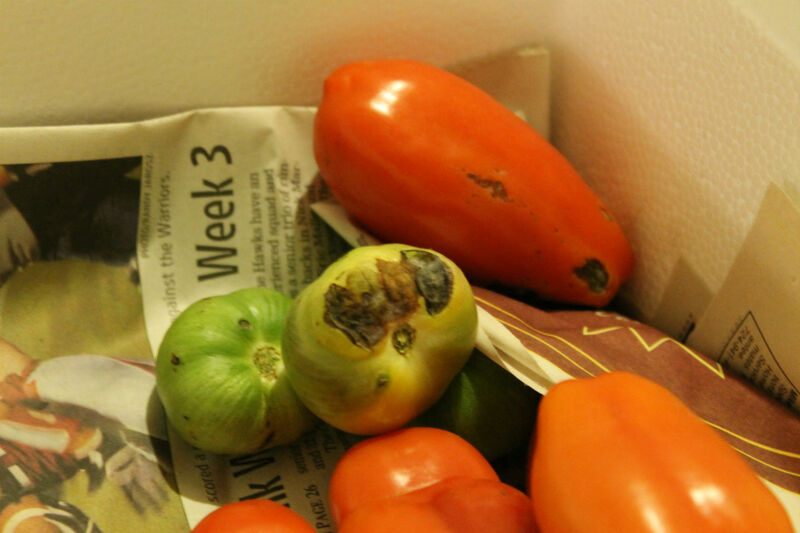 Because some of the rock hard green globes hadn’t moved even a shade closer to ripe, as the tomatoes next to it released ethylene and mold like it was their job. Which I guess, as tomatoes, it is. So those were the losses. A whole lot of wasted, rotten tomatoes. But there were some wins. 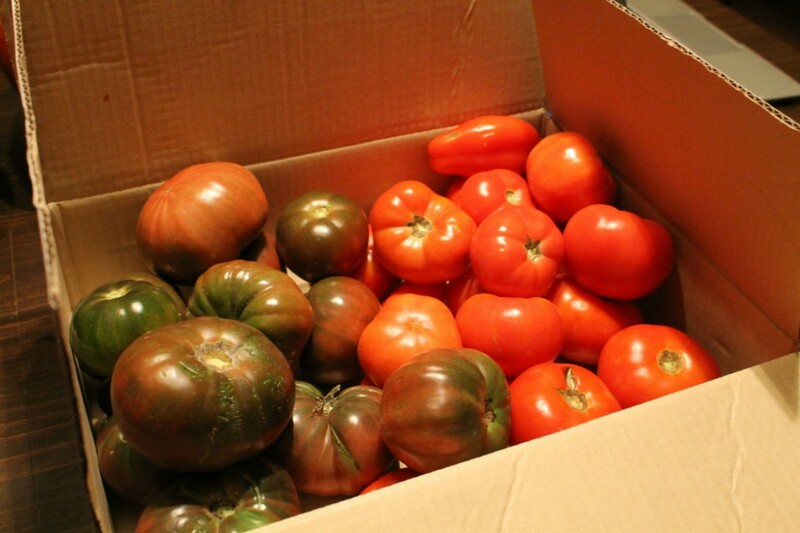 I managed to get a box full of good, ripe tomatoes that weren’t exposed to mold city. Because I couldn’t handle all of them, I took them to work to share. I was most impressed with the heirloom ones. They ripened perfectly and I caught almost all of them before they went past the point of no return. But the biggest success is that the problems that plagued the containers of full size tomatoes, were completely absent from the cherry tomatoes. Here’s the top layer of the cherry ones. Each layer was like this – with ripe Beam’s Yellow Pear tomatoes, plus a handful of ripe “regular ones” (I can’t remember the varietal at the moment). So I harvested out the ripe ones, leaving some that were halfway ripe to continue to help the others. And I came out with two bursting quarts, but enough left behind to keep eating them into the winter. 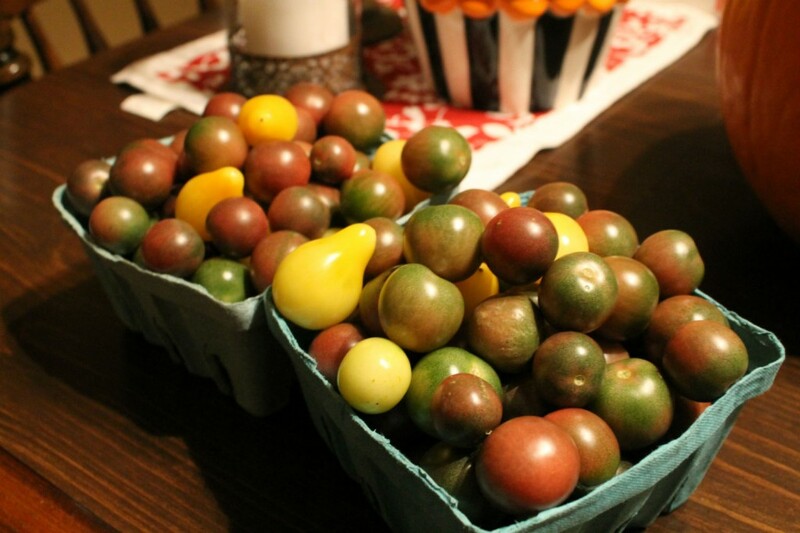 I shared these too, but I’m looking forward to the rest of them slowly ripening in the makeshift root cellar. I’m not sure how well they will continue to ripen as the weather gets colder and the basement continues its temperature drop. And I don’t know if all the ones that are going to ripen are actually done. But it’s worth keeping an eye on – especially because there was no hint of mold city! I don’t know if it was the containers that were an issue with the full size ones, or if I used tomatoes that were in too many varied states of ripeness. 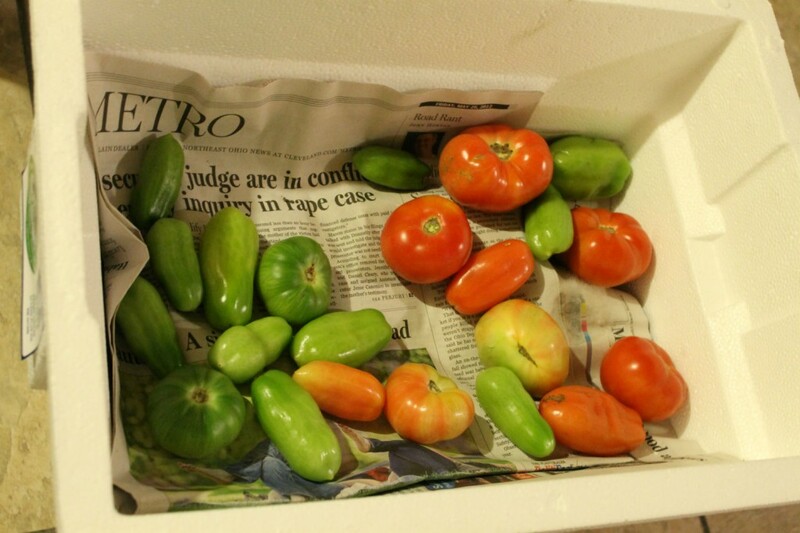 Either way though, even with all I lost to mold and rot, I saved a big box of tomatoes that I wouldn’t otherwise have had, and I am eating my garden’s tomatoes in November – something I never thought would be possible! 2014 has been the year of the tomato at Next Gen House. 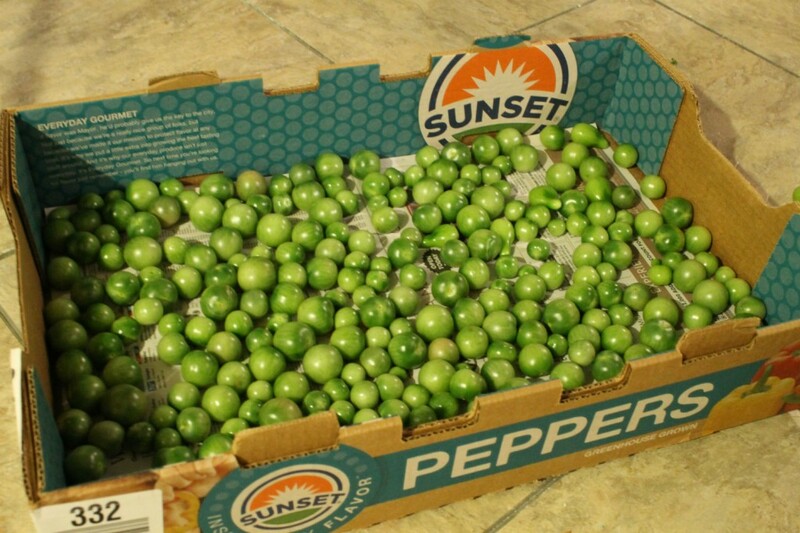 We’ve had so many that we were able to freeze 25 pounds, can them whole and make salsa, donate at least 40 pounds to our local food bank, and give away about a million to anyone who would take them. In my last garden update, I mentioned that it was coming time to finish up with the garden, since the temperatures have been low at night and the first frost feels imminent. The remaining tomatoes are all green and they aren’t changing color outside anymore. Plus, it’s mid-October and I’m over the tomatoes. So rather than just attack the gardens and take out all the plants or just let them die as-is, I went out this weekend and harvested all the rest of the tomatoes. We still had, well, rather a lot. Two Target bags and a box worth of regular tomatoes, of different varieties. On top of that, a mountain of cherry tomatoes. And these are just the fully green ones. 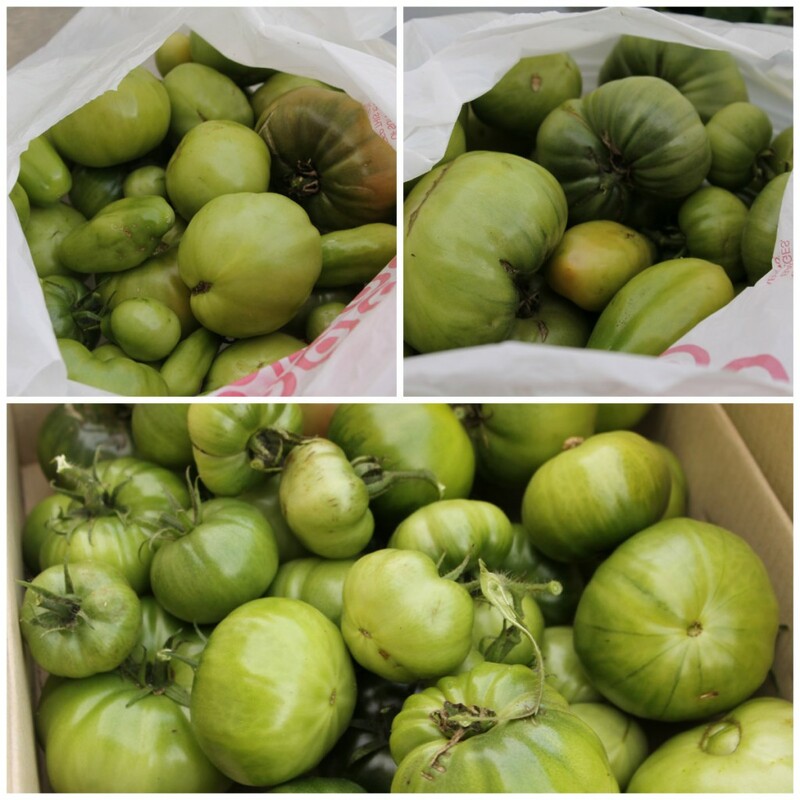 I also had another large Target bag of ripe and semi-ripe ones, plus almost two quarts of ripe cherry tomatoes. I really wish I had kept track this year of how much our garden produced, because I’d imagine we made our money back 100 times over in the monetary value of what we grew. Anyway. I brought the green tomatoes inside and decided to make use of the containers I had on hand for root cellaring and try an experiment that Mark’s aunt once mentioned to us. She told us that his grandfather used to pick green tomatoes at the end of the season, layer them between newspaper, and store them in the cool basement where they’d ripen slowly and he could enjoy fresh tomatoes beyond the warm days of summer. That’s about all the instruction she could give on it, so I went to the internet. Which, as is often the case, was a mistake. I found a ton of conflicting advice – wrap large tomatoes individually or layer them? Let them touch others or no? Remove green tops or no? Ideal temperatures and humidity? Light or lack of light? There was much debate on how shiny was too shiny and how green was too green. I don’t even remotely have enough time in my life to be sitting and determining the shine on individual tomatoes for storage. So instead of following a tutorial, I just decided to wing it and do my own thing. After all, that’s pretty much how we garden at Next Gen House anyway. Doesn’t work? I won’t repeat the mistakes next year. 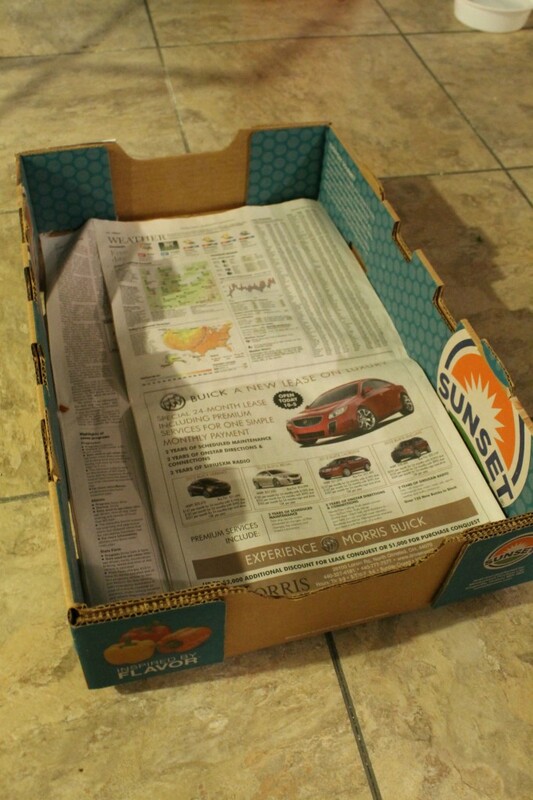 I took one of those large cardboard produce trays that we brought home from Costco once and lined it with newspaper. I then removed the little stems from the cherry tomatoes and started layering them in the box. Then I repeated the process for a few more layers. 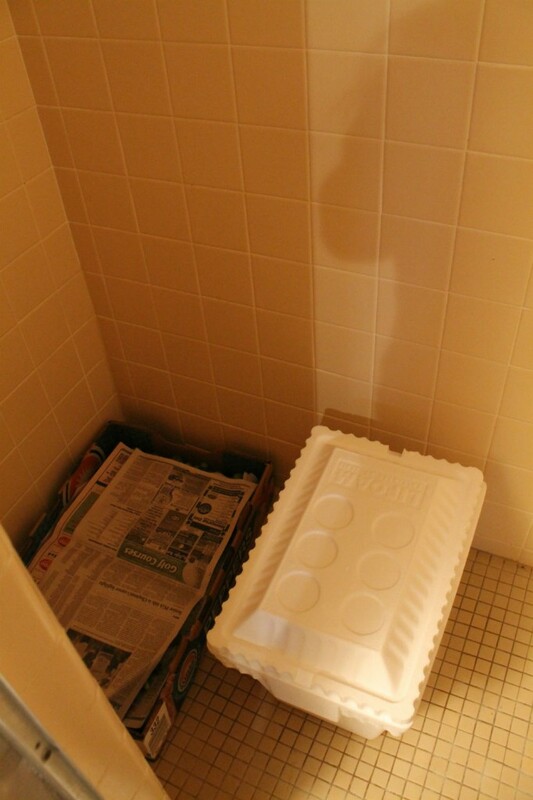 For the larger tomatoes, I used those styrofoam coolers you can get at the grocery store. I did two small ones for all of the green tomatoes. Layer after layer, I filled up the two styrofoam containers and added them in my makeshift root cellar: our basement shower. 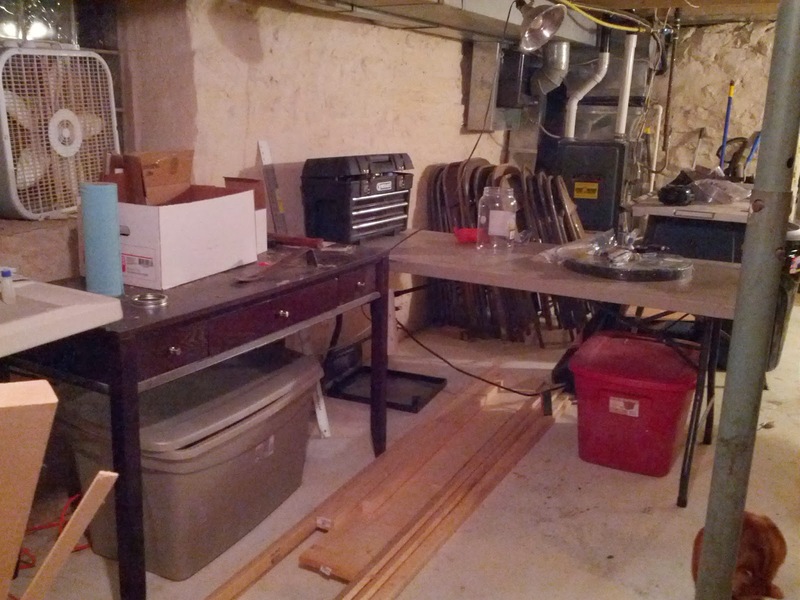 This is the first thing I’ve been able to store down there, and it’s all that will fit now, unless we put up shelves. But that’s probably good for a first time root cellar/green tomato experiment. 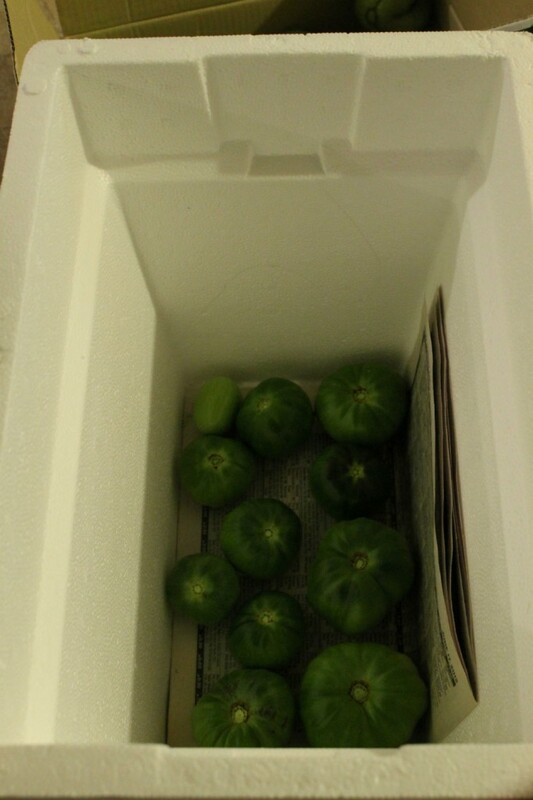 I did put some half ripe tomatoes in an extra large styrofoam container, to watch them more closely and see how they do, since they should ripen first. I’ll probably check those ones every other day or so, and check the root cellar ones each week until I start to see some changes. 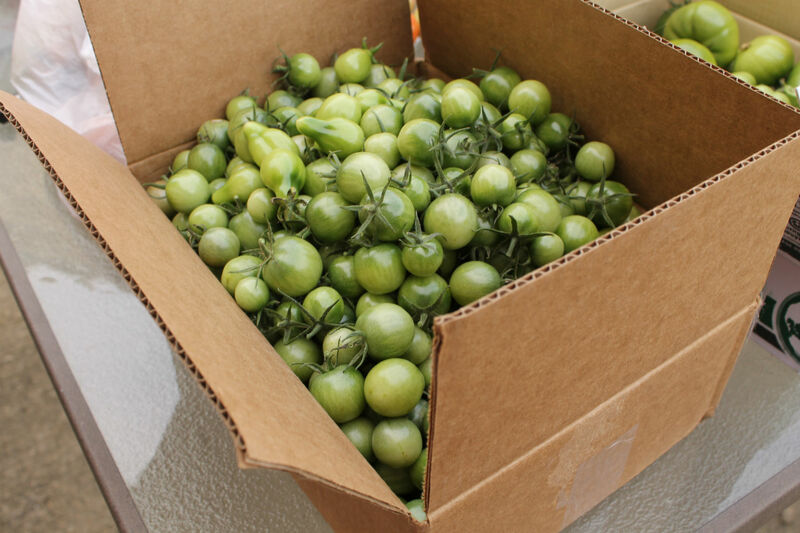 Have you ever tried to store green tomatoes? Heard of anyone doing it? 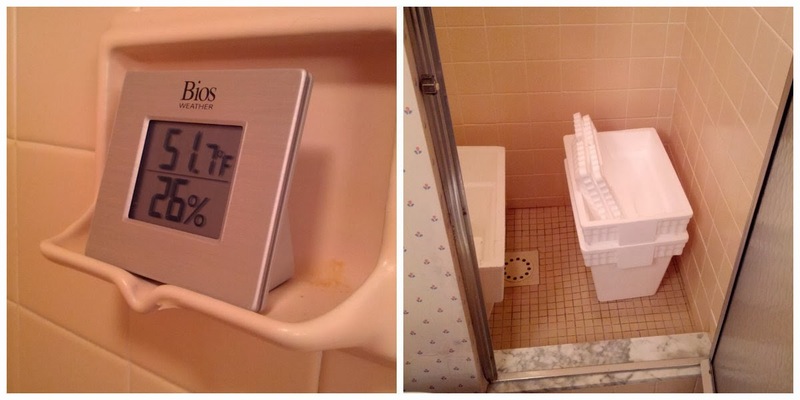 Mark ordered me a hygrometer, which reads temperature and humidity, so when it arrived I knew I needed to get moving on the basement project so I could put it to use. See how far back that goes? 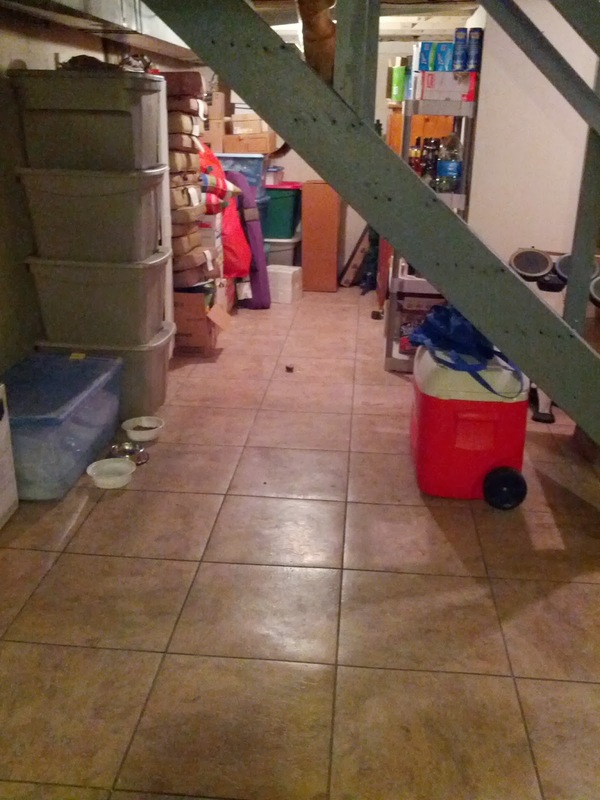 This area has the previous owner’s cabinets (filled with leftover paint and tiles) plus all the garbage you see on the floor, tubs of canning jars, Christmas decorations, a canning cabinet, shelf for alcohol, and piles of pet and garden stuff. And the top of those cabinets? That’s been my “root cellar.” Yeah. 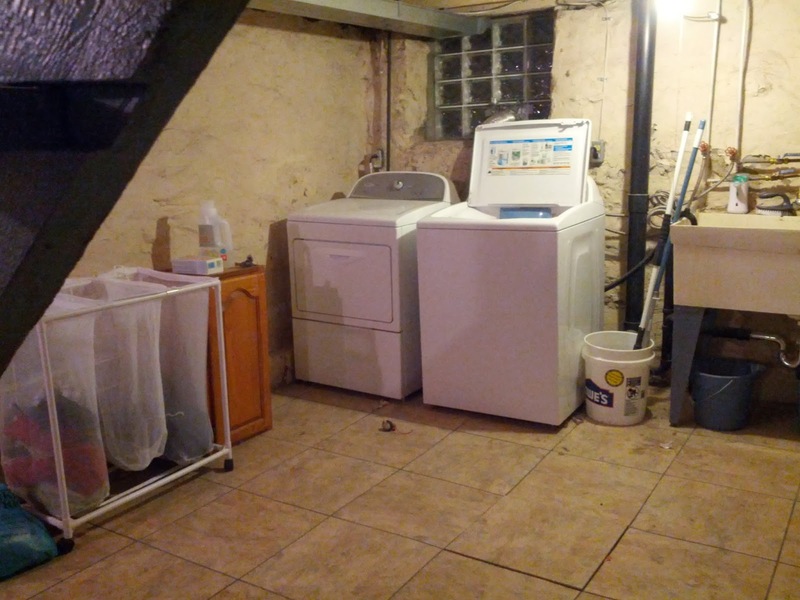 Laundry side. Not as bad, but with a giant pile of cleaning stuff on the floor that hasn’t moved in about a year. This is the other side, from the far wall. On the left we have more patio cushions, and piles of junk lined up on the entire wall. The other side is Mark’s “workshop.” Which let’s be honest, wasn’t anything like a workshop. To my right in this photo is our chest freezer. To the left is this – the other work surfaces Mark has. The treasure chest does not contain treasure. 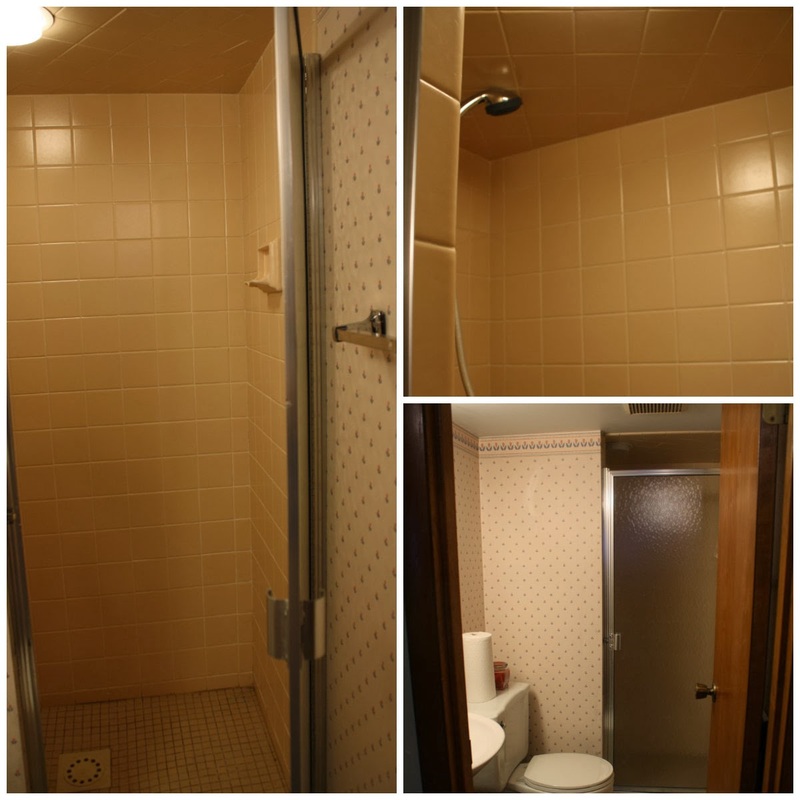 And last but not least, the shower space. Two Saturdays, 8 lawn and leaf bags of garbage, 4 boxes of flattened cardboard, and a giant yard sale pile later, we have this. I’m calling it Stage 2. The speck on the floor is one of Stormy’s toys. You can see things are stacked, there’s no garbage on the floor, and the cabinets are gone. More cat toys. And a laundry organizer, so that towels and yard clothes don’t have to go in piles on the floor. So cold, and so enlightening. The humidity is way too low for most vegetables to keep well. You’d think that wouldn’t be true, but in the absence of mold, veggies at 26% humidity would shrivel up. 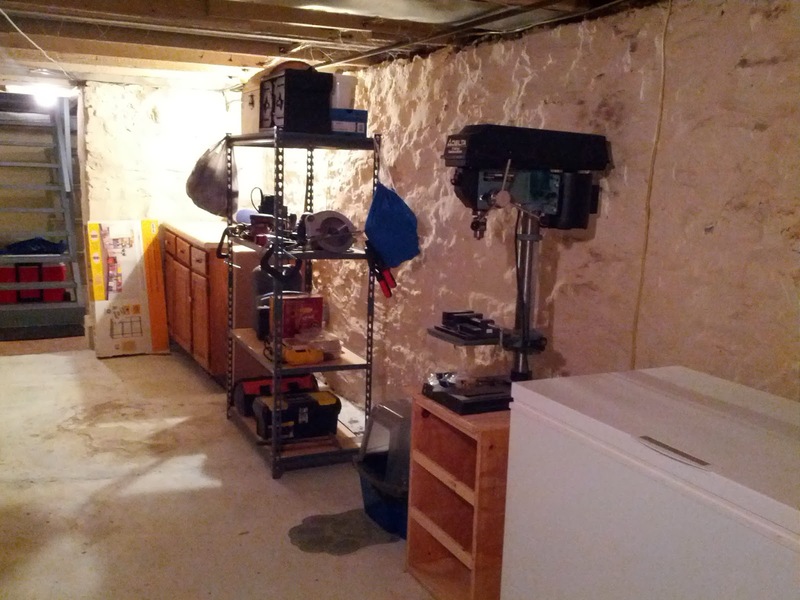 I’ve got more work to do on the root cellar part, and a few other general basement things, like a kitchen reorganization, but this is huge progress. Makes me feel like I’ll be ready for my makeshift root cellar this year after all!